When you’re recovering from surgery, the last thing you want is a problem with your incision. An incision is the cut or wound from a surgery. It is sewn closed by your doctor. It may also be stapled, taped, or glued closed. With proper care, it turns into a scar. Taking care of your incision once you return home is important to your health. Incisions vary by size and location. When to remove the bandage. In some cases, your bandage should be removed the day after surgery. This depends on the location of the surgery, the seriousness of the surgery and incision. Most wounds don’t require a bandage after a few days. However, you may decide to wear a bandage to protect the incision. Keep your incision dry. This is especially true for the first 24 hours. Avoid showering or bathing the first day. Try taking a sponge bath instead. It’s usually okay to wash with soap and water by the second day. Take a shower instead of a bath if you have stitches or skin tape on your incision. Gently towel-dry the incision after washing. Removing the stitches. This is done by your doctor. You should not remove your own stitches. He or she will remove stitches that don’t disappear into your skin on their own. Those types of stitches are usually removed 3 days to 3 weeks after surgery. This will depend on where they are and how quickly you heal. Your doctor may apply skin tape after the stitches are removed. Skin tape provides additional wound support. The tape can be removed in 3 to 7 days. 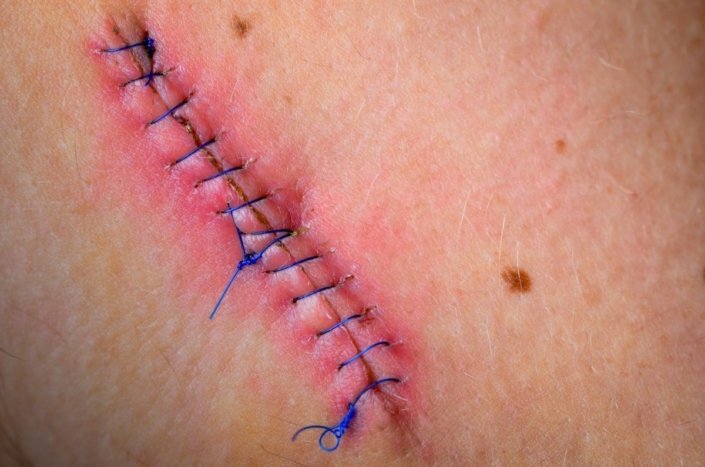 Sometimes, your incision will be closed with internal stitches (stitches under the surface of your skin). Those typically are absorbed by your body gradually and don’t need to be removed. Healing skin may need months to regain most of its strength. Limit movement around the stitches. Limiting movement of the area around your incision improves healing. Avoid activities that could cause your incision to pull apart. Your doctor may ask you to avoid lifting, straining, exercise, or sports for the first month or so after surgery. Call your doctor if the incision pulls apart. Always wash your hands before caring for your incision. Ask your doctor if you need to use a rubbing alcohol-based soap or wipes to clean the wound. If you incision breaks open, call your doctor. Your doctor may decide not to close it again with stitches. If that happens, your doctor will show you how to care for your incision a different way. This will likely involve the use of bandages to absorb the drainage that comes from the incision. The bandages will have to be changed frequently. The incision will heal in time, from inside out. If your incision is red, this may be a sign of infection. Some redness is normal. However, call your doctor if the redness is increasing or if it spreads more than half an inch from the wound. Call your doctor if you see pus in the incision or if the incision is more than mildly tender or painful. Your doctor may ask you to apply an antibiotic ointment to the incision. This does not require a prescription. If your incision bleeds, replace your bandage with a clean, dry bandage or gauze. Apply pressure directly to the incision for a few minutes to stop the bleeding. If it continues to bleed, call your doctor. If you’re outside in the sun, cover your scar with tape or sunscreen for the first 6 months after surgery. A healing scar will darken and become more noticeable if it gets sunburned. Can a new incision become infected during my hospital stay? How can I prevent my clothing from irritating my incision?